Another Mojo review, this time of the classic graf doc in its lavish, full-on DVD reissue form. If you don't have it, go to www.stylewars.com and right that wrong straight away. "Graffiti prepared me for the army," says artist Skeme during one of many excellent catch-up interviews included on the mammoth double disc edition of this pivotally important 1982 documentary, released for the first time in the UK. In the film, the teenage Skeme, stood in his New York kitchen, scowls behind his seated mother while she expresses a steadfastly resigned dismay at his illicit artistic activity. Today she still cannot fathom why he and his cohorts wanted to risk arrest, injury or worse just in order to spraypaint their nicknames onto the side of what one calls the "gigantic, rolling pages" of a subway train. 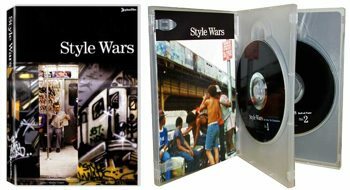 Style Wars attempted to document, analyse and explain the explosion of graffiti art that consumed New York in the late 1970s and early 1980s. It was made by outsiders: Tony Silver, a filmmaker, and Henry Chalfant, a sculptor, who began photographing the ever-changing public art show that was the New York subway system of the time. Graffiti was the first of hip hop's four elements to go public. The connections to breakdancing, rapping and DJ-ing, despite extensive footage of the breakdance outfit Rock Steady Crew (later patronised by Malcolm McLaren), are made only in terms of the prizing of stylistic innovation within each discipline. Although the soundtrack is dominated by early rap, it is left to the writers themselves to tie the threads together: in one scene Dez (better known these days as radio and mixtape DJ KaySlay) and fellow writers recite rhymes from The Message. Style Wars depicts an art form in constant revolution, powerful internal and external forces keeping the movement in creatively potent turmoil. When they weren't competing with each other to out-do the last, most imperiously executed "burner", the writers were desperately trying to stay one step ahead of the New York city transit authorities, who were dreaming up ever more ingenious ways to stamp out what they saw as graffiti's scourge. New York's then mayor, Ed Koch, at one point outlines a scheme to guard train yards with wolves: but writers like Cap, who waged war on his fellows by painting over their work, were every bit as destructive. The writers had to work fast, and be prepared for their art to be obliterated within hours. Despite its vivid depiction of the desolation of New York's outer boroughs, the film captures a time of comparative innocence. Crack, which turned users in to zombies and dealer gangs into guerrilla armies, was still some months from infesting these neighbourhoods, changing the mood, tone and content of hip hop culture forever. Today, these places are covered with paid-for advertising: a kind of corporate graffiti, considerably more sinister than the dayglo exuberance of Skeme and his friends, its brainwashing intent and intrusiveness excused because its creators have money. The stars of Style Wars had a purity to their artistic imperatives, and their work – preserved by Chalfant and Silver, and beautifully presented in an extensive gallery on the second disc here – has an allure time's passage has only enhanced.